Its well known by all that computer dominates the whole world and most of our work oriented with it, it is inevitable for one at contemporary days.., there are many and many people who's time is very minimal who are away from computer TV and games etc.., though it may cause many problems to the heavy Pc users (Users most of the time in front of Pc) but the most prior is Eyes.., because the first you may be affected is by eyes. Obviously there is no of way get ridding out off computers, TV and games. Then how else we can protect it from damages.., there are tips to safeguard and simultaneously continue our personal and professional likes as well. You would have felt your eyes dry and itchy at times reason is lack of lubrication, Re-wetting eye drops (basically artificial tears) lubricate your eyes and relieves lot of strain. These drops should be used at least 5-6 times a day, but can be used whenever necessary, try and opt for drops without preservatives. After your work before going to bed don’t forget the treatment: take some hot water (not too hot!) :) dip a clean white cloth in it squeeze mildly until the water doesn't drops.., close your eyes and place the cloth over your eyelids.., this relieves you from lot of strain in eyes. If possible you can even try this treatment few times a day when you take breaks. However it’s better to consult your ophthalmologist before stepping forward. While working on your Pc Turn gently around for windows and watch the greenish trees and plants for few moments, it’s not only relaxes our eyes but also reduces the work pressure or tension or strain, what ever it is. 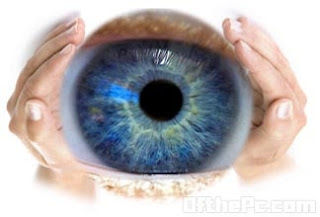 7.Extend the gap of MonitorExtend the distance of Monitor right from your sight as possible as you can (place close to the end of your table) and also seat the monitor below your eye sight level as well.